Purple Sorcerer Games offers an ever-so-slowly expanding selection of Dungeon Crawl Classics adventures! 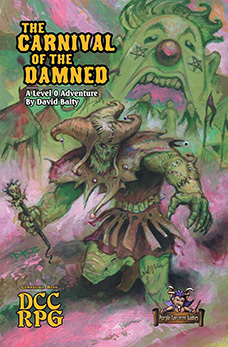 Challenge your players with numerous SC Series Dungeon Crawl Classics adventures set in the massive crumbling ruins of the swamp-ravaged Sunken City! The Sunken City makes it easy to introduce waves of beginning characters to your world and is the perfect place to kick off extended campaigns. 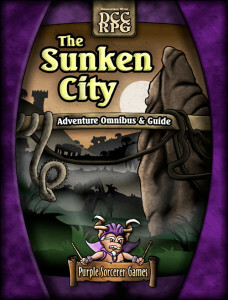 The Sunken City Omnibus. All four Sunken City adventures combined into a single full-color tome, with a host of new material including adventures seeds, tips, magic items and new monsters! Perils of the Sunken City introduces players to the Sunken City, and is now a ‘Popular Electrum Pick’ at RPGNow, placing it in the top 2% sellers there all time! A Gathering of the Marked is our most massive adventure to date: three times the length of Perils and filled with all sorts of goodies and extras, including two tablet versions for both large and smaller format devices. Lair of the Mist Men continues the fun of The Ooze Pits, is a great value and a wild, gonzo romp though a mind-bending environment for 1st level characters! 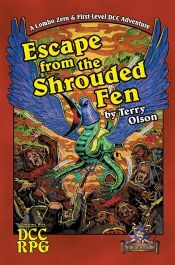 Escape from the Shrouded Fen by Terry Olson. What happens when a demon dies? Oozing, scalding, deathblood floods the land, cursing it forevermore. Every seventeen years, the blood moon rises and the Fog Beast beckons villagers into the Shrouded Fen; those that follow never return. Now you have been chosen! Seeking ancient ruins, vast treasure, and arcane lore, you plunge deep into the mist-laden swamp. Plants impale corpses ravaged by man-eating birds, while specters of past victims roam the blood-cursed land. A mysterious floating portal defies entry, though the bog’s hidden artifacts are rumored to provide the key. Can you solve the riddles of the swamp and escape from the Shrouded Fen? Contains both a zero-level funnel and a 1st level sandbox adventure! Designed to be played in a single furious session, our new line of Instant Action Adventures are perfect for when you want to get right into the fight! 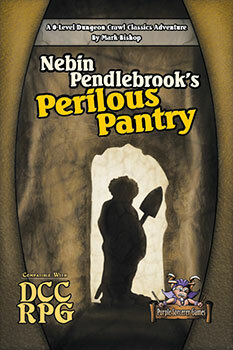 Nebin Pendlebrook's Perilous Pantry. The tiny village of Bitterweed Barrow is unaccustomed to mysterious tunnels, missing halflings, or the need for brave adventurers... but now it has all three! Can a band of gong-farmers and shoe cobblers muster the courage to descend into the darkness and confront the terror that waits beyond Nebin Pendlebrook's unexpectably perilous pantry. 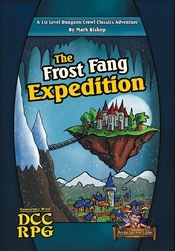 The Frost Fang Expedition. The Frost Fang Expedition challenges PCs to reach the top of a frozen and treacherous peak on a mission of discovery: why have huge chunks of a mysterious sorcerer’s floating castle begun raining down on the once quiet village of Neverthawes? The quest for answers will uncover hidden motives, fearsome foes, and deadly environments galore. The Carnival of the Damned by David Baity. A band of villagers are trapped in a mist-shrouded carnival in the dead of night, facing death at every turn. Can they survive twisted oddities like the corpse-filled Tunnel of Love and the dreaded Bone Coaster? And there's clowns. Lots and lots of clowns. An adventure designed for both 'next serf up' tournament style play and as a traditional 0-level funnel. Corpse World of the Carrion King. A band of the recently dead wake in a place of madness, stranded on a mountain-sized corpse floating in the mists of no-time. Fighting for a second chance at life, they must piece together the insane babblings of the shattered souls they encounter to find a gate rumored to offer escape back to the world of the living! M-Series Once your players move beyond the early levels, transition to the M Series of adventures, beginning with Against the Vortex Temple. The M Series will take your characters on a journey from local obscurity to legendary reknown! Coming as soon as the Sorcerer get healthy.